Senedd Live returns tomorrow morning for the Health, Social Care and Sport Committee. That completes Stage 4 - the final text - of the Additional Learning Needs and Education Tribunal (Wales) Bill. The Bill will create a single statutory plan, the individual development plan (IDP), to replace the existing variety of statutory and non-statutory SEN or LDD plans for learners in schools and further education. The aim is to "ensure greater consistency and continuity and, unlike the current system, ensure that provision and rights are protected regardless of the severity or complexity of needs." Education Secretary Kirsty Williams has outlined her proposed approach for how the new system will be implemented here. Stage 4 – a vote by the Assembly to pass the final text of the bill. The final item today is the Stage 4 debate of the Additional Learning Needs and Education Tribunal (Wales) Bill. The Bill passed Stage 3 on 21 November. 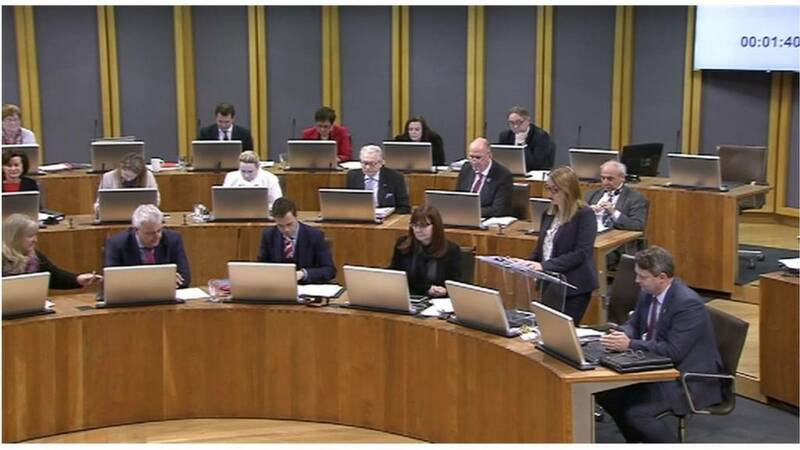 The Additional Learning Needs and Education Tribunal (Wales) Bill will set up a single system - called an individual development plan - to replace "statements" which currently address the needs of an individual aged up to 25. It will also allow parents and young people to appeal to the special educational needs (SEN) tribunal, set to be renamed the Educational Tribunal for Wales. Earlier this year it emerged that the bill will cost £13.1m more than previously thought. UKIP's Gareth Bennett creates a stir in the Siambr. "Many of us in UKIP don't quite share the same enthusiasm for so-called human rights as people in other parties. "We are specifically concerned that the increasing focus on the rights of minorities will ultimately impact negatively on the rights of the majority population". He adds, "there's only so much deviation from the norm that any society can take". Conservative Mark Isherwood expresses concerns over the increase in reported hate crime in Wales. He says the Equality and Human Right’s Commission’s efforts to ensure that equality and human rights are embedded in work taken forward under the Well-being of Future Generations (Wales) Act 2017 will require “real and meaningful dialogue between communities, individuals and their public services” as called for by the Future Generations Commissioner in her draft strategic plan. Plaid Cymru's Sian Gwenllian says the Equality and Human Right’s Commission’s aim of eliminating violence in the community is "hampered by the lack of progress in implementation of the Violence against Women, Domestic Abuse and Sexual Violence Act (Wales) 2015". Leader of the House Julie James says "this year's annual review covers an unprecedented period for equality and human rights in the UK. "The UK's impending exit from the European Union brings with it uncertainty about many things, including the future of European funding streams." We move on to a debate on the Equality and Human Rights Commission Annual Review 2016-2017. The draft Regulated Services (Service Providers and Responsible Individuals) (Wales) Regulations 2017 are approved. AMs discuss the draft Regulated Services (Service Providers and Responsible Individuals) (Wales) Regulations 2017. Part 1 of the Regulation and Inspection of Social Care (Wales) Act 2016 (“the Act”) introduced a new system of regulation of care and support services in Wales. These Regulations include provisions for offences in the event of failure by a service provider or a responsible individual to comply with specified requirements. The current transport strategy was produced in 2008. Ken Skates says the "new Welsh Transport Appraisal Guidance will be published tomorrow, and will better enable transport planners to develop and implement interventions that better meet the transport needs of people living in Wales. "This guidance will be critical to the success of the three metro programmes and delivery of key transport projects such as on the M4 and along the A55 corridor and the A40 in west Wales." The final statement of the day is by the Cabinet Secretary for Economy and Transport Ken Skates: "Connecting Wales, a strategic approach to Transport". Plaid Cymru's Bethan Jenkins says Mr Davies' statement "should be called an understatement as it clearly understates the issues raised in both the auditor general's review and the Welsh Government review". Effective management of performance of community safety? Conservative Mark Isherwood questions whether the plan will improve strategic planning to better co-ordinate activity for community safety, and whether it will ensure effective management of performance of community safety. Alun Davies says "we have now undertaken a comprehensive and wide-ranging review of community safety partnership working in Wales. "I am confident this will help us further develop the many successes of the Welsh Government’s approach". He adds, "In partnership with the Youth Justice Board Cymru we have achieved significant and sustained reductions in the number of first time entrants to the youth justice system. "We have halved the number of fire casualties and fires including grass fires set deliberately. "Welsh police forces have recruited an additional 500 community support officers paid for by the Welsh Government while many areas in England are losing these valuable community assets." We move on to a statement by the Cabinet Secretary for Local Government and Public Services Alun Davies: 'Working Together for Safer Communities'. On 7 February the late Carl Sargeant, as Cabinet Secretary for Communities and Children, announced a review of the way public services work together to help make our communities safer in Wales. He said that "almost 20 years on from the ground-breaking Crime and Disorder Act 1998 that established a statutory requirement for public services to work together in partnership to improve community safety we now have an unprecedented opportunity provided by the current implementation of the Well-being of Future Generations (Wales) Act 2015 to establish a sustainable approach to partnership working in Wales that will deliver safer communities for future generations." UKIP's David Rowlands says the Welsh Government "must move away from a satellite companies approach" to one that encourages those that establish headquarters in Wales. Plaid Cymru's Adam Price welcomes "some aspects" of the plan such as the new focus on the foundational economy and decarbonisation. But he describes it as "an action plan with five calls to action but no clarity about who the actors are". He describes the decision to abolish the 48 advisory panels as a "mini bonfire of the quangos". The Conservatives' economy spokesman Russell George says he is "underwhelmed" by the action plan, adding that there was no mention of the flagship enterprise zones and little on procurement. He says it is Labour's fourth major economic strategy since devolution, and yet gross value added (GVA) has declined over that period.